Welcome to the Amusement Park! Join Panda Panda and friends as you enter the amazing world of Panda Panda Funfair Party! Collect your ticket and enter an amusement park carnival filled with fun and exciting games, activities and events for you to enjoy! ⭐️ 9 Amazing funfair carnival games and Activities! ⭐️ Enjoy amusement park activities with Panda Panda and friends! ⭐️ Give Panda Panda some facepaint or even dress him up with a new hat and glasses! ⭐️ Make delicious popcorn, choose a box and then see if Panda Panda enjoys it! ⭐️ Ride the ferris wheel, spin the prize wheel and much much more! ⭐️ Win coins and prizes to unlock new minigames! ⭐️ Find hidden collectible items, can you find them all? ⭐️ Complete achievements to receive bonus rewards! ⭐️ Family friendly design and artwork suitable for Players of all ages! ⭐️ Enjoy fun activities and your favourite carnival games with Panda Panda and friends! Enjoy 9 Exciting Funfair Games and Activities! From whack-a-mole to claw machines and from popcorn making to face painting, Panda Panda Funfair Party has something for everyone. 9 fun attractions and activities mean that there is no end to the fun that you can have with Panda Panda and friends, will you be able to hook all of the ducks? Or will you try popping balloons instead, there are so many fun things to do in Panda Panda Funfair Party! Playing funfair games is fun because of the prizes and Panda Panda Funfair Party is no exception! Join in the fun and see how many shiny coins and exciting prizes you can win! Unlock fun new games with your coins, will you be able to unlock them all? Enjoy Face Painting with Panda Panda! Why not give Panda Panda some facepaint, you can choose the colour and design any type of facepaint that you want! What colours will you use? Don’t forget to choose some cool looking glasses and a new hat to dress up Panda Panda as well! Want to explore? Then you can! Feel free to explore the funfair and carnival as much as you want and watch as Panda Panda and his cute animal friends walk around too. 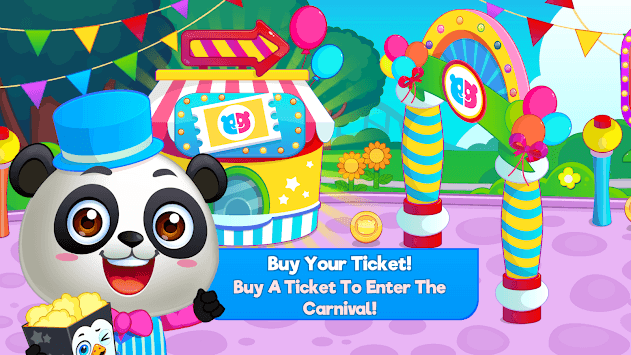 You can pick up any of the characters by simply tapping on them and dragging them to where you want to go, so bring your favourites with you as you explore Panda Panda Funfair Party! Panda Panda and friends love the ferris wheel! Drag characters into the seats and then press the arrows to watch them spin! You will even get some coins for helping Panda Panda and friends to have lots of fun! No Funfair would be complete without popcorn! Make your own popcorn and choose the coolest box. Remember to scoop it into your box and try not to spill any! Once it is ready you can see if Panda Panda likes what you have made as you feed it to him at the party! 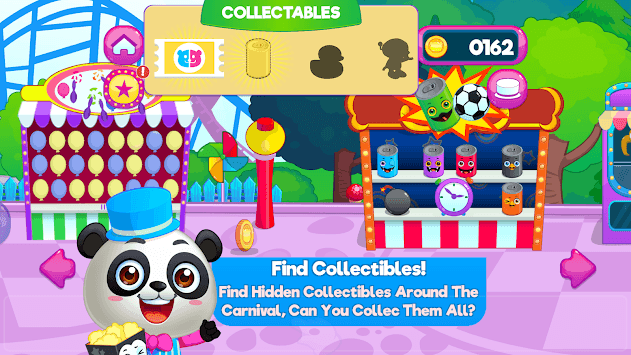 Explore the Funfair Party and the different attractions to find hidden collectible items! Will you be able to find all of the secret, hidden collectibles while you are at the carnival? Be sure to stay on the lookout for anything unusual while you enjoy all of the amusement rides! Panda Panda Funfair Party is packed full of fun activities and carnival actions for you to complete, check out the achievements list for new challenges and different ways to play the games! Completing an achievement will even give coins! Will you be able to complete them all?